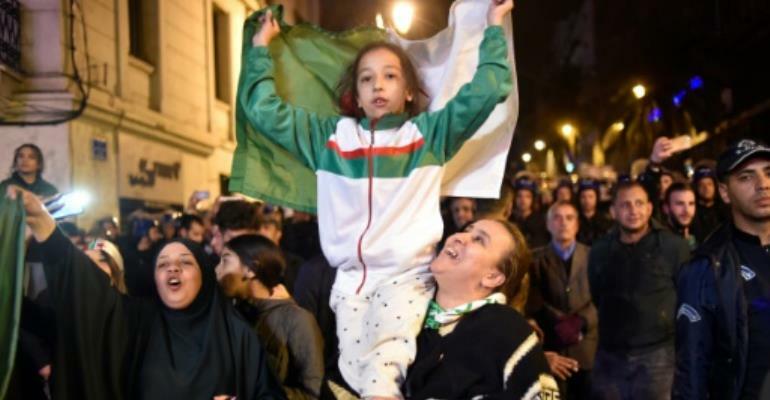 Flag-waving Algerians celebrated the resignation of ailing leader Abdelaziz Bouteflika after two decades in power, but vowed to keep protesting to demand sweeping change to the country's whole political system. The 82-year-old president ceded power in the face of massive street demonstrations that have shaken the North African nation, with state media announcing late Tuesday he had submitted his resignation with immediate effect. Car horns sounded on the streets before jubilant crowds converged in the centre of the capital Algiers to cheer the departure of the veteran leader, who has rarely appeared in public since suffering a stroke in 2013. At the same time, many people said they were determined to continue demonstrating, rejecting any transition that leaves power in the hands of the "system". On Monday, his office said he would resign before his mandate expires at the end of the month. 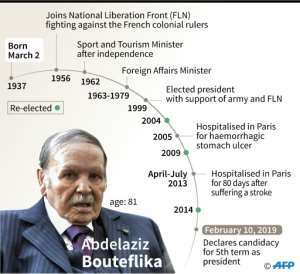 And as pressure mounted, state television announced late Tuesday that Bouteflika "officially advised the Constitutional Council of the end of his term of office as President of the Republic". "This decision which I take in my soul and conscience is destined to contribute to the appeasement of the hearts and minds of my compatriots, to allow them to take Algeria towards a better future to which they legitimately aspire," his resignation letter said. 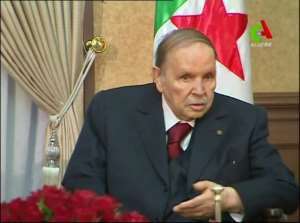 Footage showed Bouteflika, dressed in a beige North African tunic and sitting in his wheelchair, handing the resignation letter to the head of the Constitutional Council, Tayeb Belaiz. Russian, a longtime ally of Algeria, called for a transition without foreign "interference". French Foreign Minister Jean-Yves Le Drian said Bouteflika's decision to step down marked the turning of "an important page in the history of Algeria". 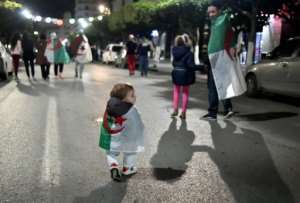 "We are confident in the ability of all Algerians to continue this democratic transition in the same spirit of calm and responsibility" that has prevailed in recent weeks, Le Drian added. Algeria's constitution says that once the president officially resigns, the speaker of the upper house of parliament, 77-year-old Abdelkader Bensalah, acts as interim leader for up to 90 days during which a presidential election must be organised. The resignation came shortly after the military demanded impeachment proceedings be launched against Bouteflika. Armed forces chief Ahmed Gaid Salah said the army's "sole ambition" was to "protect the people from a handful of (other) people who have unduly taken over the wealth of the Algerian people". A long-time Bouteflika ally, the general last week called on the president to resign or be declared unfit to rule, becoming one of the first of his longtime supporters to abandon him. The administration -- supposed to steer the country towards transition -- included General Gaid Salah remaining in his position as deputy defence minister. Discreet and rarely seen in public, Said Bouteflika has exerted increasing influence behind the scenes as his brother's health worsened, but the president's resignation could take away much of his power.